Concrete scabbling is an important process. It allows for surfaces to be roughened or reduced, making it a useful process for removing road decorations or markings and preparing surfaces for the application of grout or paint treatment. It is also widely used for anti slip applications. This can help with grooving to stop cattle from slipping, and it can also provide a good grip for forklift trucks to help them gain traction. Traditionally, concrete scabbling was achieved through the use of hammers and axes. Today’s version is very different, with advances in technology offering faster, safer and more efficient methods. This has resulted in two distinct types of equipment; handheld scabblers and floor scabbling machines. As a general rule, handheld scabbling machines are cheaper than their counterparts. They are best suited to tasks in smaller areas as they tend to have a smaller operating area than floor scabbling machines. Handheld scabbling machines can provide a versatile solution that is especially useful in compact and difficult areas. Long pole options are available to reach the trickier spots, and double and triple head handheld scabbling machines can increase the speed when covering a larger space. However, this method does have its limitations. For example, the operative is required to be close to the blast zone to work the equipment which results in a much higher risk of injury. Additionally, the end result may also be slightly inconsistent as it is based on human judgement instead of the high accuracy of a programed machine. When possible, remote controlled floor machines provide a better alternative. There are two types of floor concrete scabblers, manual and remote. These machines are best for covering a large areas such as barn floors, yards or warehouses. Hydroblast Ltd. makes the safety of our operatives the top priority, which is why we use top of the range scabblers which can be controlled remotely. This keeps people out of the blast zone, virtually removing any chance of onsite injury. Many handheld and floor concrete scabblers require an aggressive hammering action to effectively break up the concrete. This isn’t very accurate and can result in inconsistent results. 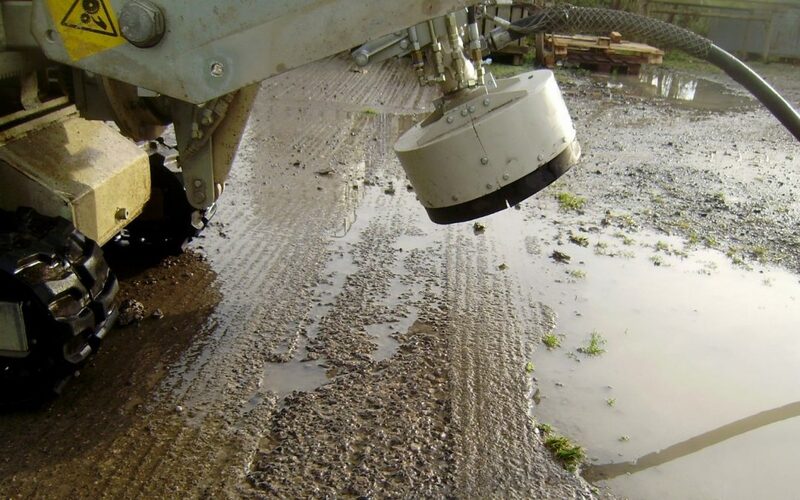 Our advanced scabbling machines use high pressure water jetting to efficiently remove any unwanted concrete, a much quieter, safer and more precise method. Using our high pressure water jetting equipment doesn’t just yield better results, it is also the best solution for the health of operatives. This is because the water dampens the effects of silica dust, reducing the chances of those nearby inhaling it. Silica dust is associated with several serious health conditions such as silicosis, lung cancer and pulmonary fibrosis. In addition to this, high pressure water jetting is environmentally friendly, accurate and efficient. This makes it the obvious choice for your scabbling tasks. Hydroblast Ltd. are specialists in concrete scabbling and removal, and we have the certifications to prove it. To learn more about our services or to make an enquiry, please contact a member of our knowledgeable team today.